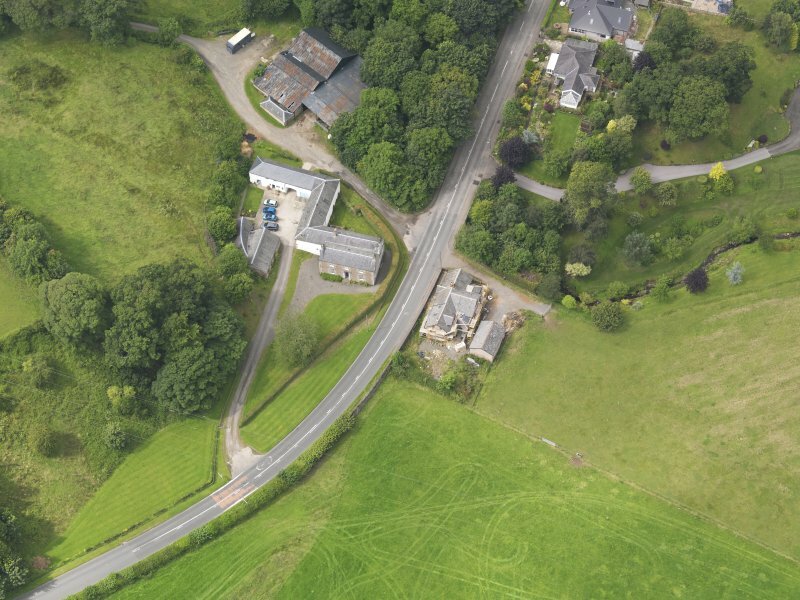 Oblique aerial view of Priorslynn Cottage, taken from the E.
Oblique aerial view of Priorslynn Cottage, taken from the SSE. See also Historic Scotland Buildings List (Dumfries and Galloway, Annandale and Eskdale, Canonbie Parish) for list description. Priorslynn, rubble-built farmhouse of the earlier 19th cent, quite plain except for the pilasterd and fanlit door. The rear block represents its late 18th cent. predecessor linked to the steading behind, with courtyard ranges of several 18th and 19th century dates; segmental-arched pend entrance in the W block. 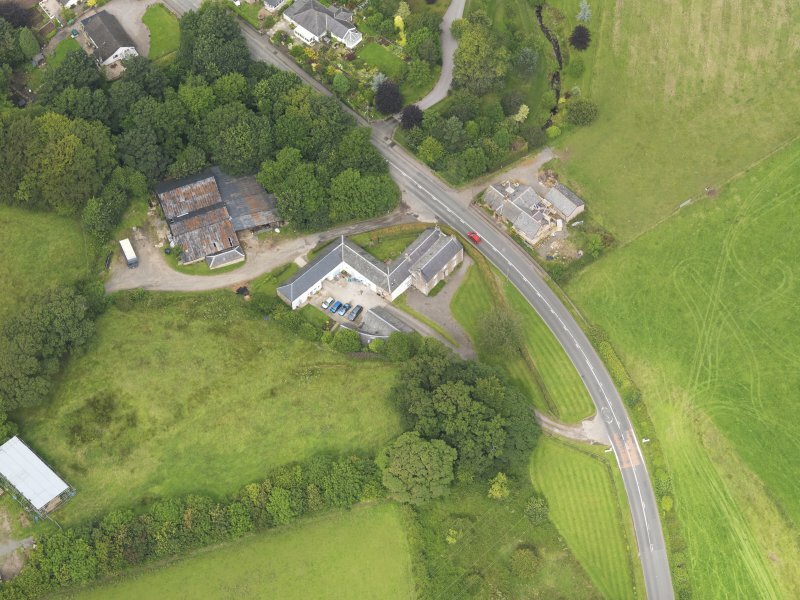 This steading dates from about 1830-40 and consists of a three-bay farm house with late a 18th century house to rear. Rubble-built, with a slate roof, the adjacent courtyard steading is also predominantly rubble-built with slate roofs, the exterior walls of most buildings being lime washed. Access to the courtyard is through a segmentally-arched pend in the two-storeyed NW range. The SE side of the courtyard comprises two sandstone gables forming the end of a two-bay block, on the SW end of which is a brick-built gable forming the end of a third, curved bay which forms the S corner of the steading. The SW side of the courtyard is bordered by a steep slope leading up to fields above. Information from RCAHMS (MKO), 9 October 1997. On the terrace above this farmstead there is a long rectangular building with walls of clay and a corrugated iron roof (replacing thatch); inside, it is divided into two compartments and has five cruck trusses. The clay walls, which have been patched with masonry and brick, are set on stone footings and have been built in thin courses between layers of straw. The basic form of the oak crucks is similar to that of the cottage at Torthorwald (no. 18), but they are bigger and better finished. They consist of single blades joined by a collar-beam and tenoned into a stout capping member at the apex; the northernmost pair of blades has been sawn from the same trunk to form complementary half-tree sections. The building probably dates from a period around 1800 when the Buccleuch estate was issuing regulations against the use of timber 'except for buildings that are to be erected in a substantial manner and covered with slates'. Clay building had long been a common feature in Canonbie. In 1772 the traveller, Thomas Pennant, noted that 'most part of the houses are built with clay', and described communal building practices similar to those at Dornock.